Exercise prescription will differ depending on the individuals fitness needs and medical history. Exercise should include dynamic balance, strength and functional floor activities, posture + gait training. Exercise should retrain or maintain the ability to get up from the floor after having fallen. Falls are preventable. Falls generally are accidental and unplanned (unless you are a stuntman or a goalkeeper!) but the risk of falling can be reduced and minimised. Slips, Trips and Falls (STF) were the most common workplace accident type for the Injuries Board. Nearly 50% of all claims made against retailers are slips, trips and falls cases according to Retail Ireland and account for the largest cause of accidents across all sectors according to the European Agency for Safety and Health at Work. Slips account for about half of all slips, trips and falls but this increases to 80% where floor surfaces are wet, slippery or where cleaning is occurring. 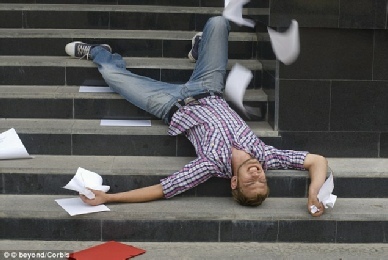 Stairs and steps - descending is a particular concern and can result in more serious injuries. Gender - many victims are female. 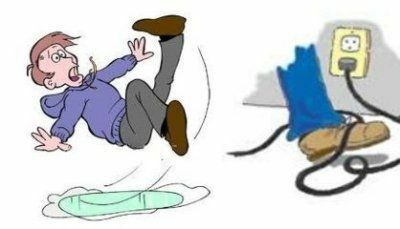 Cleaning is associated with wet floors, trailing cables, obstructed walkways etc Most victims of slip[s, trips + falls due to cleaning are not the cleaners themselves. Over-use of signs may be an issue and may themselves be a trip hazard. Signs were present and did not prevent many cleaning slips. Vehicles , especially exiting vehicles. 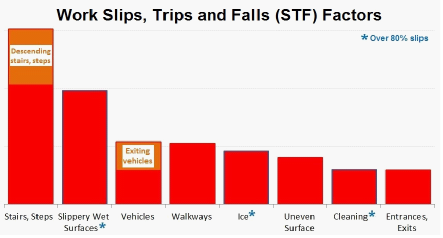 Ice (and snow) can double the number of slips, trips and falls. Many accidents happened from 6am to 11am. Entrances + exits - highest incidence occurs from 8am to 10am. Mats and floor surfaces may be factors too. Spills can occur in every workplace and the resulting wet surface increases the likelihood of a slip or falls occurring. Therefore it is important to have procedures in place to reduce this likelihood. Identifying areas where spills may occur and putting controls in place, e.g. proper mats, sufficient drainage, drip trays in anticipation of the spills will also reduce the risk. Where there are sources of liquid, e.g. equipment using water/ liquid, wash-up areas, showers, toilets, water dispenser. High risk areas need to be identified. The floor in a workplace must be suitable for the type of work activity that will be taking place on it. Where a floor can't be kept dry, people should be able to walk on the floor without fear of slipping on it. It should have sufficient roughness (slip resistance) and must be fitted correctly. Damaged flooring is high risk of slips, trips and falls. Identify it and have it repaired. Avoid damage to floors where possible. Slippery surfaces are also high risk areas. High gloss or highly reflective = high risk. Consider changing or treating floor surfaces, e.g. addition of slip resistant materials, etching. Consider effect of severe weather - Grit or salt help. Warning signs do not physically keep people away from wet floors. They will not substitute for protective measures. During scheduled / routine floor cleaning keep pedestrians away from wet / moist floors by using physical barriers. Remove when they are no longer applicable. Dispose of packing material and other wrappings carefully. Where wet cleaning, use water at the right temperature and with the minimum detergent possible. Remove excess water / liquid to assist the floor drying process. Footwear that work in dry conditions may not in wet conditions. Sole tread may clog up with debris so keep clear of waste. 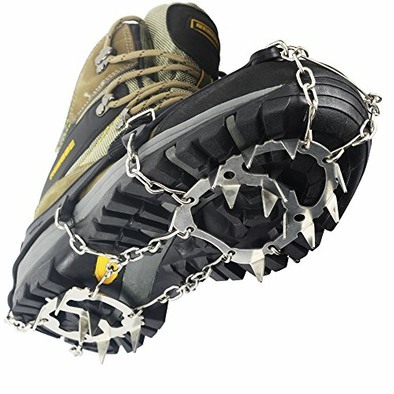 Check footwear for appropriateness of slip resistance. Avoid open shoes, sandals, flip-flops, high heels + smooth soles. A Fall is a sudden uncontrolled movement causing the body to move downwards to make contact with a lower level or the ground, typically rapidly and without control. A slip is to lose one's footing (base of support) which causes an unintentionally slide for a short distance. This may result in a fall if the centre of gravity comes outside of the base of support. 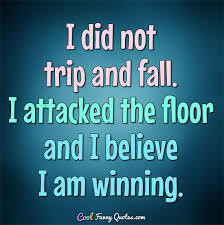 A trip is to catch one's foot unexpectedly on something while moving causing one to stumble or fall. It is often suggested that older people should slow down and take things easy. If older people stay active and put their bodies through full ranges of motion they will maintain their joints, muscles and nerves, which enables normal movement to occur. Keep fit! Take up an enjoyable physical activity. 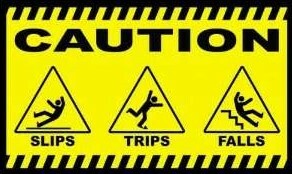 Check the slipping / tripping hazards – rugs, mats, obstacles in passage ways, etc. Position cushions and blankets so they can be reached by a fallen person if needed if stuck on the floor until help arrives. Carry a cordless or mobile phone around to summon help. Many falls do not result in injury but do impact on confidence and increase fear. Many times falls among older people are preventable. Any YES answer = increased risk. If there are 3+ YES answers there is a high risk of falling. Have you had a history of falling in the past year? Are you on four or more prescribed medications? Do you have a history of stroke or Parkinson’s disease? Have you experienced any problems with balance? Are you unable to rise out of a chair without using arms? If you are worried about falls you should seek advice from a chartered physiotherapist. They can advise on how to keep mobile + flexible and how to prevent a fall. Refer to other professionals as appropriate. They can refer to suitable exercise options in the community. Risk factors that are not not modifiable with exercise include age, gender, chronic medical conditions, + non-correctable vision. Risk factors that are modifiable include poor balance, fear of falling, low strength and power, poor gait and functional ability, depression and arthritic pain, which may all be helped by exercise. Many older people do not injure themselves in a fall, but have great difficulty getting up again after the fall, thus remaining on the floor for some time - ‘a long lie’. Shock, injury, fear of further damage to the body by trying to move and a lack of physical fitness or knowledge how to get up may be important causes of remaining on the floor. Training on how to get up from the floor may be very useful for those who have fallen, and indeed for those at risk of falling for the first time. For those who have not yet fallen, there are many more vigorous exercise programmes that may be appropriate – like Tai Chi, dancing and bowls. A Falls Exercise Programme should (re)train the ability to get up from the floor. It should also practice other skills such as crawling + rolling, summoning help and keeping warm while on the floor.